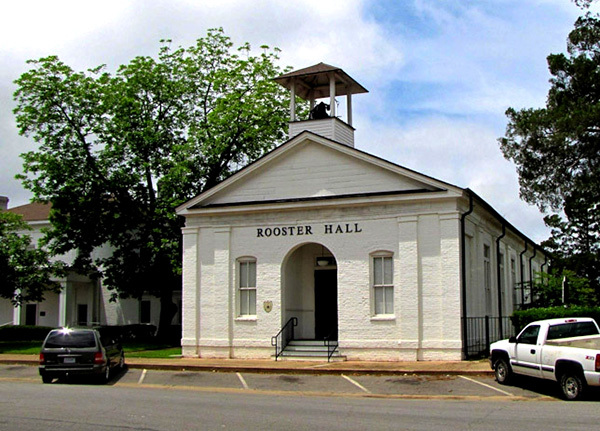 Rooster Hall, in Demopolis, Marengo County, was built in 1843 and has served a variety of functions since that time. Initially, it was the church sanctuary for the Presbyterian Church in Demopolis, but after the Civil War, federal troops occupied the structure and used it as a court house and county seat. In 1871, the building was given to the city of Demopolis and five years later was leased to the Demopolis Opera Association until 1902. After that, it was the city hall, a fire station, and an office building, among other things. The city currently uses it for a variety of official functions and as an event space.